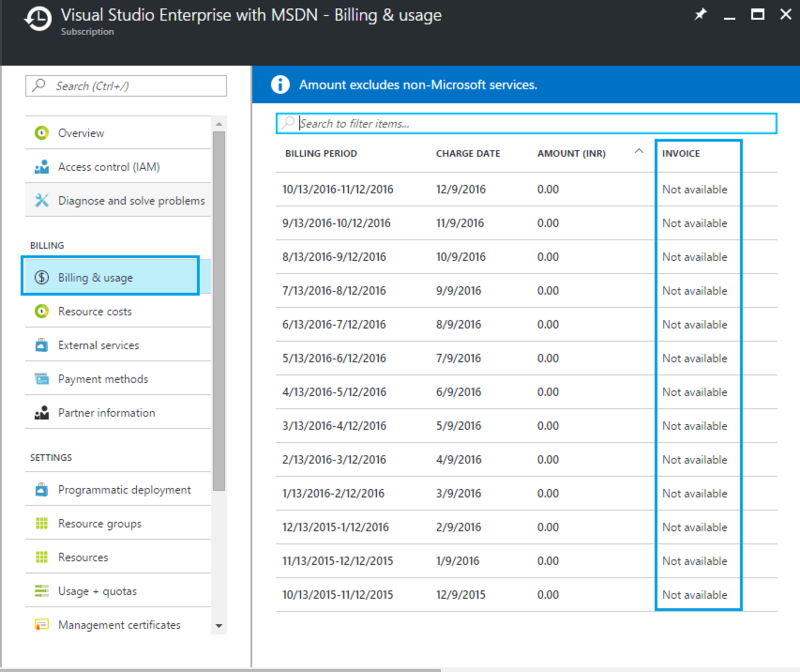 In this blog, readers will become acquainted with how to download billing invoices directly from Microsoft Azure portal. For novice Cloud developers, aspiring Cloud architects and all other IT professionals associated with Cloud computing, especially with Microsoft Azure, this blog with smart tips will prove to be useful. Microsoft Azure Account: If it is not there, create your free account. Go to Microsoft Azure portal, log in with your Azure account credentials. 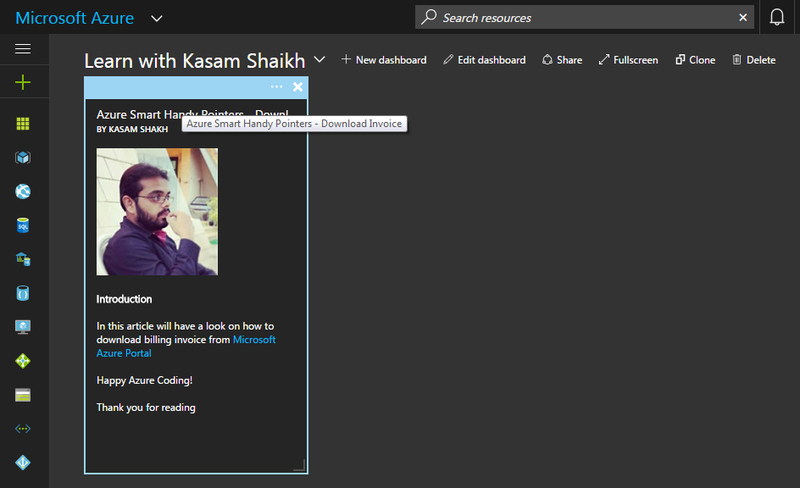 You will be at Azure portal dashboard. Once landed, open browser panel. 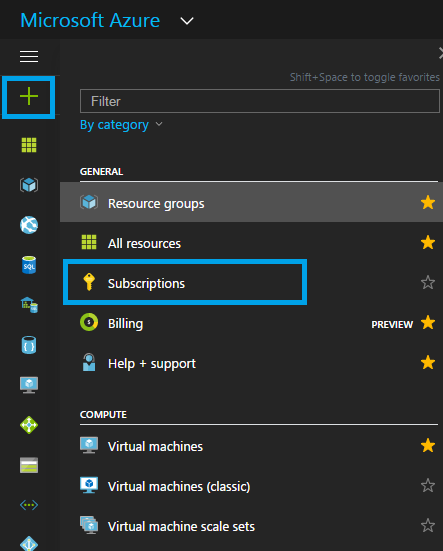 Now, there are two with which you can open browser panel in Azure portal. Hit button ‘B’ ( any case ) from the keyboard. This will open browser panel. Select ‘Subscription’ from browser panel. Subscriptions associated with the account would be listed under ‘Subscriptions’ blade. In Overview, check ‘My Role’ description. Here ‘My Role’ should be mentioned as ‘Account Admin’, only then will you be able to download the invoice from the portal. As you can see in the above image, my role is mentioned as an Owner, as my account is being assigned by the primary account holder. I will not be allowed to download the invoice. For this blog, I have requested my primary account holder to logon to portal for having a look. Click Billing & Usage under billing section. Here, along with Billing period, Charge Date & Amount, a fourth column will appear named Invoice with the link to download an invoice of the respective billing period. The image shown below refers to the fact that there is no link as Bill is under free credits or 0 (zero). (Image is blurry, as it was captured from the video). Kindly find the screenshot, mentioned below, with the billing details, which are generated in the new tab. (Image is blurry and masked as it was captured from the video). The image given below is from my account. As seen, there is a column named ‘Invoice’. 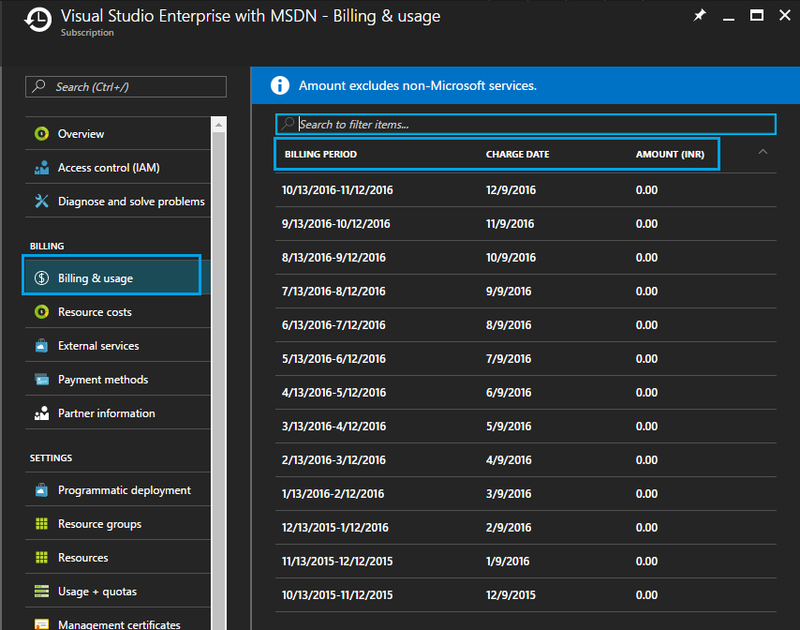 It is easy to download an invoice from Azure portal being an account admin. I hope you have enjoyed this tutorial. If you have any questions with respect to the same or any interesting use-cases or suggestions, please do comment below. Knowledge grows by sharing. Don’t forget to share this article. If it has helped you, it will also help many others too. Thank you. Happy Azure coding.